Less expensive, lighter, and smaller than its electromechanical counterparts, power electronics lie at the very heart of controlling and converting electric energy, which in turn lies at the heart of making that energy useful. From household appliances to space-faring vehicles, the applications of power electronics are virtually limitless. Until now, however, the same could not be said for access to up-to-date reference books devoted to power electronics. 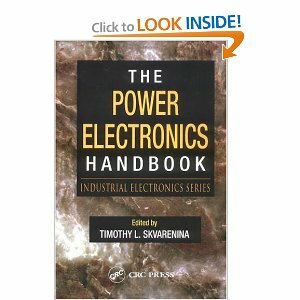 Written by engineers for engineers, The Power Electronics Handbook covers the full range of relevant topics, from basic principles to cutting-edge applications. Compiled from contributions by an international panel of experts and full of illustrations, this is not a theoretical tome, but a practical and enlightening presentation of the usefulness and variety of technologies that encompass the field. For modern and emerging applications, power electronic devices and systems must be small, efficient, lightweight, controllable, reliable, and economical. The Power Electronics Handbook is your key to understanding those devices, incorporating them into controllable circuits, and implementing those systems into applications from virtually every area of electrical engineering.